The name Saint Patrick?s Plains was bestowed upon the area possibly by John Howe, the leader of the party which first reached it in 1819 and 1820. Howe?s first expedition crossed the mountains from Windsor and arrived at the river (he didn?t then know it was the Hunter) near the present-day Jerry?s Plains. The following year with a larger group, he used a modified and somewhat easier route, and on 15th March 1820 arrived at the river downstream at Whittingham, close to the present site of Singleton. The original name was soon shortened to Patrick Plains. Initially this name covered a very large area ? from the foothills of the range between the Hawkesbury and Hunter Rivers to the south, Maitland (then called Wallis Plains) to the east down river, and spread out into unknown country to the north and west. Districts as far afield as Scone (Invermein) and Merriwa (Gummun Plains) were included. Other names which were used in early settlement days were Wollombi Brook and Cockfighters Creek for the areas bordering this stream. Hunters River was the name for the area along the River, not only in the Patrick Plains area but for the whole length of the valley. And Goulburn River applied to the land along this tributary. By the early 1840 many settlements and villages had developed and were named, some officially and other informally. Names the early settlers had given to their grants were frequently adopted for a wider area. The first town, designated Whittingham by the authorities, never developed. Settlers preferred Benjamin Singleton?s chosen site where he had built his inn beside the ford. This early village had the advantage of being a good resting place for travellers and horses or bullocks before tackling the river crossing to proceed up the valley. When the first post office was set up the name Darlington was allotted to the town, but this has only persisted in a small part of what developed into the town of Singleton. By 1836 Benjamin Singleton was offering housing allotments for sale. In 1843 a district Council of Patrick Plains was set up, and this defined the districts as covering a more compact area than in the 1820s. It still began in the range between the Hawkesbury and Hunter Rivers in the south, and the range at the head of Fal Brook in the north; Black Creek (Branxton) to the east and Jerry?s Plains to the west. These boundaries remain. When, however, the Municipality of Singleton and the Shire of Patrick Plains amalgamated in 1975. The name Singleton was retained and Patrick Plains discarded. As time goes on less and less people remember the old name, so the Family History Society of Singleton Inc decided to keep the name alive, at least in a small way. Thus our journal became ?The Patrick Plains Gazette?. The Village of Murrumbidgerie is now called Wongarbon. The Murrumbidgerie Cemetery is now called the Wongarbon Cemetery. [S4] NSW BDM, New South Wales Government (Reliability: 3), 1825. 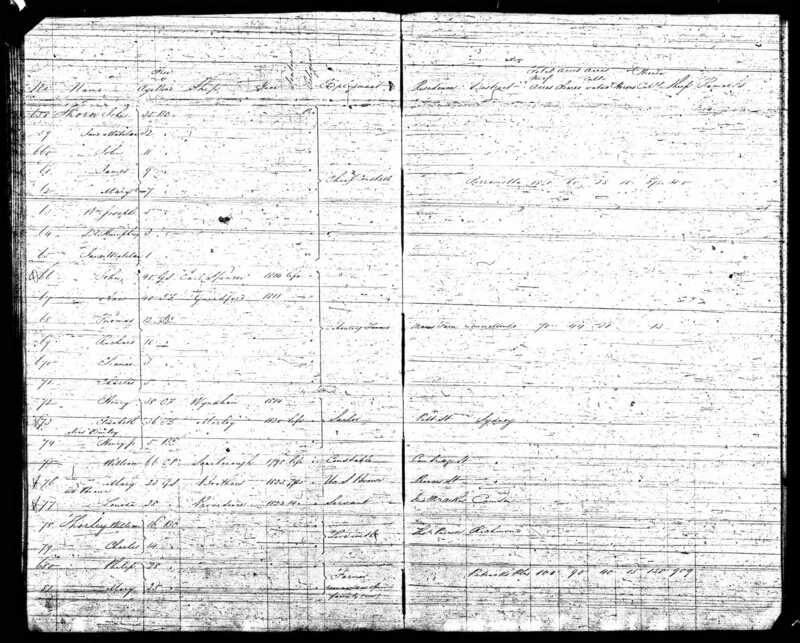 The NSW Government Department of Birth Deaths and Marriages obtained this record from early church records. The entry could cover Birth,christening or both. [S152] John Griffiths (Reliability: 2), 13 Aug 1825. William W Thorley born 13 Aug 1825, Mount Thorley Homestead, Patricks Plains, New South Wales, Australia. [S4] NSW BDM, New South Wales Government (Reliability: 2), 1901. [S280] Wellington Times Newspaper, 4 (Reliability: 3), 31 Oct 1901. 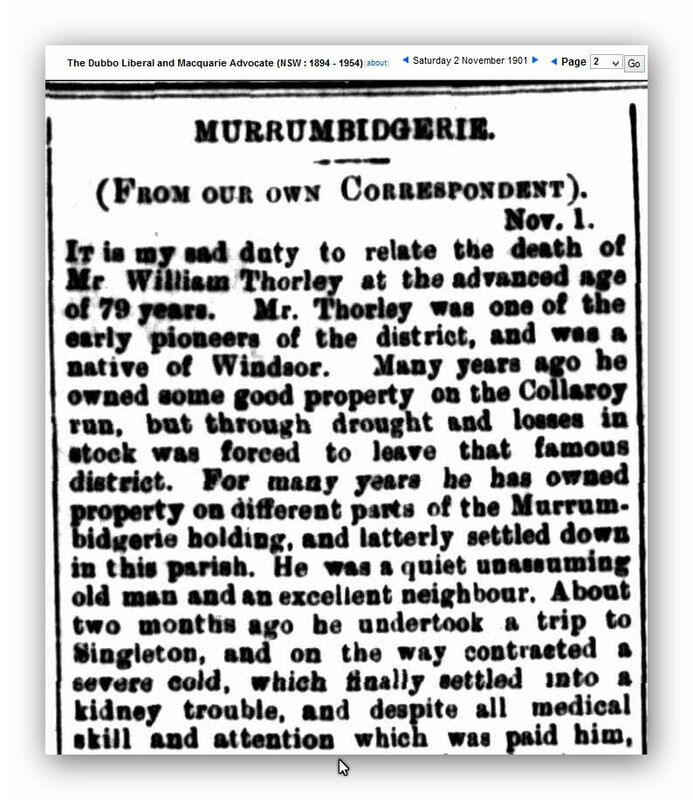 Death occurred at Murrumbidgerie on Monday of Mr William Thorley, at the age of 80 years. See attached Newspaper Clipping. Published Wellington Times Newspaper, Thursday 31 October 1901, page 4. [S281] The Dubbo Liberal and Macquarie Advocate Newspaper, 2 (Reliability: 3), 2 Nov 1901.